Drinksinitiatives.eu is a dedicated web portal by spiritsEUROPE, the European association that represents the spirits sector. They committed us to design, develop and host the site. Even if the deadline was tight, we delivered the site just in time to launch it in November. Great work & thanks for getting it all done on time! 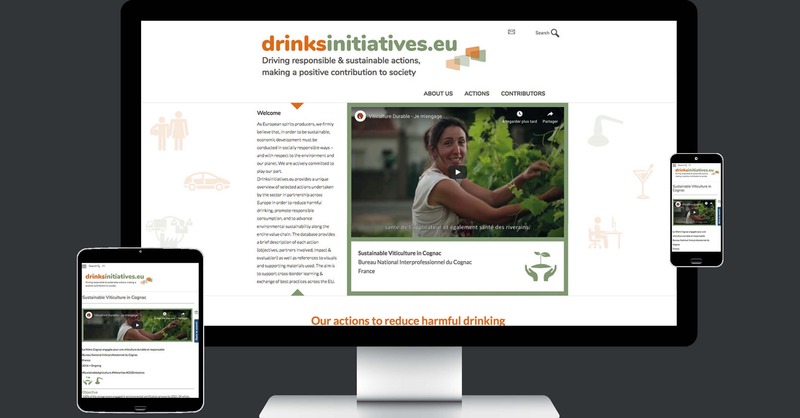 Drinksinitiatives.eu includes a huge database easily accessible via a sophisticated search tool (by action areas, by action types, by countries, by date, by contributors). The site provides a brief description of each action (key figures, objectives, partners involved, impact & evaluation) as well as references to visuals and supporting materials used (videos, photo gallery, etc.). The aim is to support cross-border learning & exchange of best practices across the EU. We developed the site from scratch with a special attention to the backend upload feature so that any contributor can easily upload text, posters, clips, sound without any training to promote their actions.